I almost titled this post FO Friday, but it is more accurate to call it half-FO Friday. Last week I showed you my finished Poms, and then I disappeared again, sorry ’bout that! 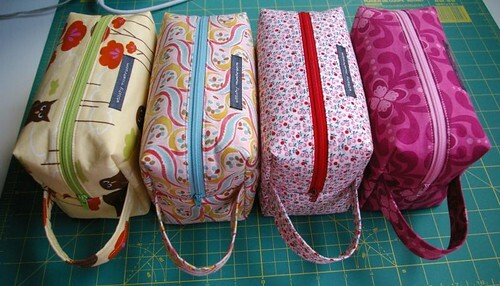 While I was gone, I worked on a new batch of box bags. These ones are part 1 of the ones going to Stitches East, I still have many more to do! Better close up pictures of the large ones here and here. Besides finishing these bags I worked on a sock which will be a sample at Stitches East. I finished it a couple days ago and that’s one less thing I have to think about! 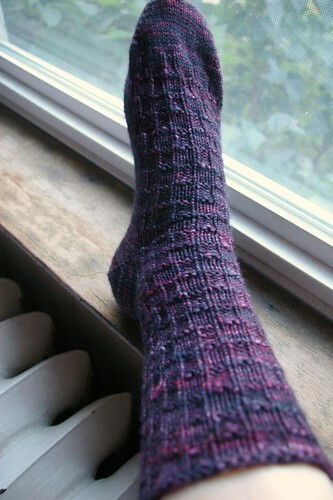 The pattern is Tesserae by Knitspot and the yarn is Madtosh Sock in Black Currant. I love the color of this yarn, dark purples, blues with a hint of lighter pink. I can’t wait to have a finished pair! I have a few more projects on the needles which I’ll show you in my next post! The blue & brown large one matches my Kindle case! Will you let me buy it? You have been busy! I hope Stitches East is a great success for you. oooooo love the colors in the sock! I just started a sweater using the madelinetosh worsted in logwood. My stash needs more Madelinetosh! Darn someone got to the large brown and blue bag first 🙂 I was wondering, if I sent you fabric, would you be willing to make a custom bag for me? 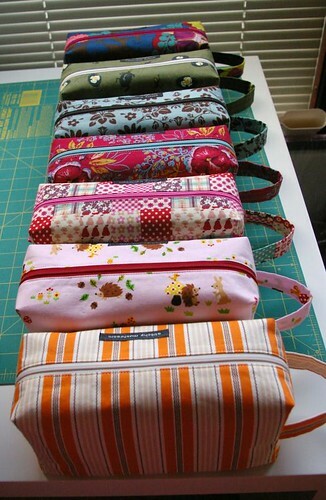 I absolutely love the small bag you made but I think some of my spindles would fit better in a large bag.